The Montgomery County Commissioners have directly circumvented the will of the voters, leading our county further into debt. County voters defeated a $200 million road bond proposal in the November 2011 election, 53% to 47%. The proposal was largely defeated due to the rapidly growing county debt in recent years. From 1996 to 2011, county bond debt has skyrocketed over a whopping 1154%. And the 2011 road bond proposal was the second in six years, after voters approved issuing $160 million in road bonds in 2005. In 2010, the Bond Review Board calculated total Montgomery County debt to be the seventh highest among Texas counties at $625,144,927. County voters exercised fiscal responsibility by defeating the 2011 road bond proposal. Unfortunately, the commissioners aren't listening. Under the 1971 Texas Certificate of Obligation Act, counties can issue bonds without voter approval for "obligatory" matters. However, the act provides for bonds to be issued for practically any reason to avoid what it terms the "cumbersome procedure" known as competitive biddings and elections. The Montgomery County Commissioners have invoked this act by passing two $15 million sets of Certificates of Obligation this year. But based on what is known about the project list, it seems to possibly mirror the list rejected by voters in the 2011 bond election. 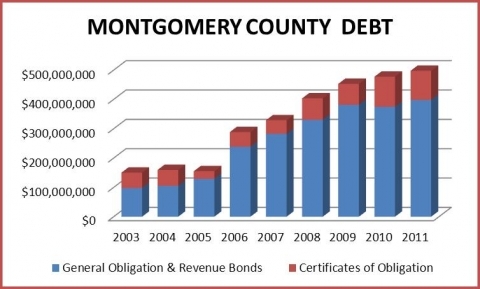 In other words, the commissioners have used the Certificate of Obligation Act to disregard the decision of the citizens of Montgomery County and issue the debt anyway, only in $15 million increments. This action by the commissioners not only severs the public's trust in their ability to govern responsibly and honestly, but also keeps Montgomery County on the dangerous path we've seen ourselves walking in recent years: increased utilization of methods by which we issue debt unchecked by voters. The Certificate of Obligation Act does allow us one check against the County, albeit difficult to execute. Chapter 271 stipulates that if 5% of registered voters petition the local government within thirty days after they publish their intent to issue the Certificates, the government must hold a referendum on the bonds. For Montgomery County, this means collecting approximately 13,000 signatures in 30 days. The Texas Patriots PAC intends to fight as hard as we can to prevent our county from being saddled with more debt, even if it means walking the neighborhoods to gather signatures. We hope you'll join us in the fight.